Young children are natural scientists and engineers! They are curious about how the world around them works and why things do the things they do! They are full of questions, are willing to roll up their sleeves and experiment, are usually not discouraged when their first attempt at something fails and are creative problem-solvers! STEM from the START is designed to harness all of that natural curiosity, inventiveness, perseverance and creativity to help students explore and learn more about physical science and the world around them. Each video lesson in the STEM from the START Curriculum features the Quinks. 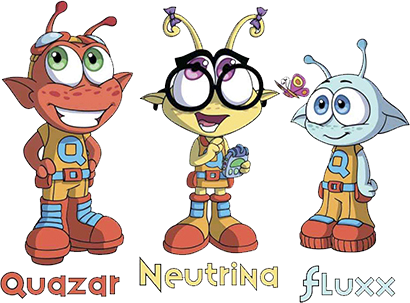 The Quinks are three curious aliens, Quazar, Neutrina and Fluxx, who have come to Earth to learn more about how things on the planet work! With the help of a human friend, they explore basic principles of physical science. Each lesson in the STEM from the START curriculum is presented as a mission! In each mission students are asked to observe, research, develop hypothesis, make predictions, experiment and reach conclusions - just like real scientists! Curious about the QUINKS? Read on! Each video lesson includes short segments where a concept or idea is introduced and explored and then a “Discovery Break.” Each Discovery Break is a question posed directly to the child. The video lesson is designed to be paused or stopped at this point so students can engage in an activity or exploration. These activities and exploration are found in the Discovery Guide for each lesson. Activities and explorations in the Discovery Guide are designed to be something that can be done with items found in most classrooms or homes! In addition to Discovery Breaks, video lessons include Discovery Questions which are indicated by a spinning question mark. There is time after each Discovery Question to pause the video lesson so a child can respond. In each lesson the Quinks visit scientists and engineers in the real world and see how they use the concepts covered in the video lesson in their jobs. "Children must be engaged early with STEM, and STEM from the START is the best curriculum tool I’ve seen for doing that." "The technology engages the children then the carefully constructed activities and experiences ensure that the necessary learning takes place"
"What I really like is the level of engagement of my students that are hardest to engage and keep focused." "Students that need more support in terms of attention really seem to engage more with the Quinks. It’s amazing to look out on a class about motion or materials and have the attention of every child, and then for them to turn around and be able to answer questions about their learning experience – it’s great!" "I really like the teacher guides. Basic, easy to read and gets right down to teaching"
"The teacher guide was amazing and I think I will share it with parents. What a great way to build the connection to home with some really accessible science materials." "Knowing that the Next Generation Science Standards (NGSS) are built into the lesson is very important to me." "Like having a teaching partner who is an expert in science. Students were very engaged, laughing, eager to see what Willow would say next. Love the way the vocabulary words are animated to reinforce the concepts"
"Seeing the words, along with audio in multiple contexts, along with authentic examples, truly engages my English Language Learners with the vocabulary"